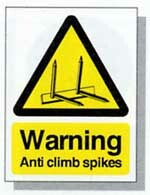 Anti Climb Warning Signs are designed to alert people to a possible risk from anti climb precautions. When employing perimeter anti climb security products it is essential to be aware of your `duty of care` which extends to everyone who may come onto your property, including intruders. If someone was to injure themselves or damage their clothing on your perimeter security then there is the possibility that you could be sued in the civil courts. The Occupiers Liability Act 1984 provides full details of an occupiers responsibilities to persons other than recognised visitors. WARNING: Installation of any form of physical anti climb barrier, at a height of less than 2 metres from the ground, may be illegal and in all cases displaying appropriate warning signs may be a legal requirement. It is generally recognised that warning signs should be displayed in such a way that a sign is visible from any angle of approach to a protected barrier. For straight linear installations such as walls or fences, it is recommended that signs are displayed at approximately 3-5 metre intervals on the approach side of the protected boundary fence or wall. This should be sufficient to ensure that nobody can avoid seeing the warning signs. See our complete range of effective warning signs here. While it is generally understood that people need to be warned about spikey, potentially dangerous anti-climb barriers many people are unaware that, when you employ anti-climb paint, you need to display appropriate warning signs. 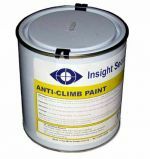 Anti climb paint is a non-drying, petroleum gel based paint that remains slippery after application. Coating walls, poles and drainpipes with this material provides a highly effective and high safety barrier to climbing and intrusion. But since it never dries out, anti climb paint can be easily transferred onto clothes and skin. If people are not appropriately warned of the presence of anti climb paint there is the possibility that they will get some on their clothes. If they do they you could potentially be sued to retrieve the cleaning costs. 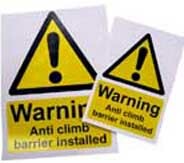 See our anti climb paint warning signs here. Hi Visibility Warning Signs - to be used where anti climb barriers have been installed. These signs are manufactured from UV stabilised plastic material. Hi Visibility Warning Signs - to be used where anti climb spikes have been installed. Hi Visibility Warning Signs - warn people that anti climb paint has been used.